The Word Publications Message Search (WPMS) is a software package that is based upon what we believe is the most accurate English transcription of all 1209 of Brother Branham’s sermons that is currently available. Brother Branham's focus on the Scriptures was such that as well as carefully transcribing and proofreading the sermon text, the dedicated and consecrated team at “The Word Publications” were able to identify over 96,000 references to Bible verses that he made during the 19 years of his recorded Ministry. To make them easy to look up, each of these references have been annotated above the sermon text at the top right hand corner of the particular paragraph's in which they were expressed. The Scripture references are remarkably extensive. They cover (often comprehensively) all but three books of the Bible and involve over individual 7000 verses, each one being separate to the others. Given that the King James Bible contains just over 31,000 verses, Brother Branham’s familiarity with and coverage of the Bible text was as detailed as it was broad. To take advantage of the extensive Scripture references, the WPMS Search package has been designed to allow the user to easily find and follow whatever Brother Branham said about any book, chapter, or verse in the Bible throughout his recorded Ministry. The sermons have been separately arranged in folders according to the year in which they were preached and by the major topics that Brother Branham addressed such as the Daniel Series or the Revelation Series. The folders and their contents can be quickly and accurately searched for both the many references that Brother Branham made to Bible verses, and also for words, phrases or topics. The sermons can be searched separately, collectively or in any chosen combination. The WPMS Search package is an invaluable tool to help those who wish to either learn more about Brother Branham's extraordinary Ministry or to study the Last Days Message in depth and with clarity to discover for themselves what Brother Branham taught, believed and practiced. Almost any device that employs Windows, Linux or OS X operating systems can now be used to rapidly and accurately search the text of the sermons for words or phrases. In addition, the latest upgrade now enables the Search package to run on a USB thumb drive for true portability and convenience. Three summaries of the Scripture references are included to identify the verses and disclose the extent and frequency to which Brother Branham discussed or touched upon them. They provide an insight as to where he placed his emphasis over the years under the leadership of the Holy Ghost. To those already familiar with his Ministry, it will be no surprise to find that his most frequent Bible quote by far was Hebrews 13:8 which he drew our attention to more than 2600 times. The founder of “The Word Publications,” the late Apostolos David Mamalis first met William Branham in 1961. The pair went on to become firm friends. Brother David Mamalis was a scholar of the Greek language and as his friendship with Brother Branham grew, he found himself having the privilege of being called upon to advise a Prophet of God in the correct use and meaning of the Greek language that was employed to write both the original text of the New Testament and also as the Septuagint translation of the Old Testament. The latter was completed in the 2nd century BC and was considered by the early Christian Church to be authoritative. Brother Mamalis was a gifted Bible teacher and eventually settled in Phoenix, Arizona, becoming the Pastor of the "Phoenix Christian Fellowship" Church, where he faithfully served the congregation for over thirty years. During this period of time he was employed as a senior lecturer at the Arizona State University. To aid in the study of the sermon content, Brother Mamalis developed, published and filed copyright for his "Index and Classification of Sermons by Rev. W.M. Branham” (US copyright A59483) that set Brother Branham's sermons in date order (i.e., the order in which they were preached) and so from humble beginnings, he began to make copies available of the sermon recordings that he collected to anyone who was interested. Four years later in 1973, he established “Information And Media Consultants,” a company that went on to provide many people with sermon tape libraries. With the wisdom of hindsight, it is now evident that the hand of the Lord had been upon Brother David from an early age to equip him with the necessary knowledge and expertise to classify, faithfully transcribe, print and distribute the 'Message of the Hour," a project to which he dedicated a significant portion of his life. After a life of service to others, David Mamalis was called home to be with the Lord in 2005 and the independent transcription of Brother Branham’s sermons that he had begun many years earlier, has since been completed by a small, consecrated and very competent team coordinated under the watchful eye of his widow, Sister Pollie Mamalis. Please note that the system of sermon names and reference numbers provided by The Word Publications is unique. If you need to cross reference the sermons, please refer to the Word Publications Master Index which is included in the Word Publications Message Software Search (WPMS) package. Digital copies of the sermons are available for free download from here. To learn more about the dedicated people who have faithfully labored for many years to make The Word Publications unique sermon transcriptions available, please click here. The Word Publications Message Search package has been put together with the generous support of the author of the DocFetcher Open Source search engine, a powerful software application made available under the Eclipse Public License. 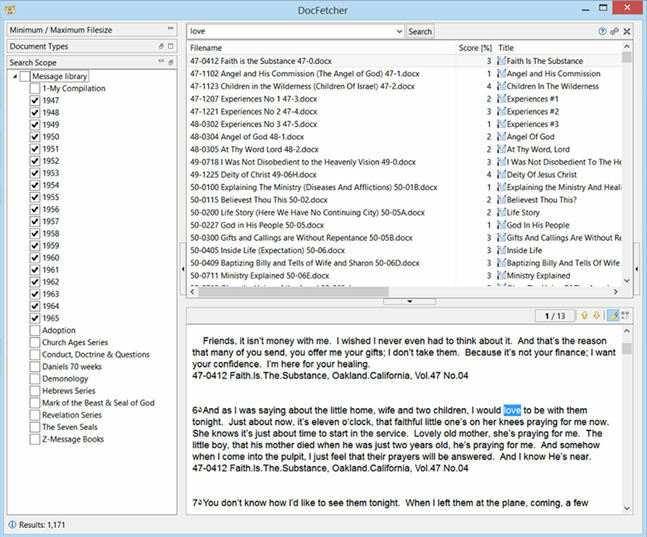 DocFetcher runs on all versions of Windows, and also on Linux and OS X. Both 32-bit and 64-bit operating systems are supported. This is how the search program will look once you have it running on your computer. Installation of the WPMS Message Search package is straightforward and well within the capabilities of even a new computer user. Full instructions are included in the package and so after downloading the zip file that best suits the device you intend to use it on, we recommend you take a moment to review the simple installation instructions before proceeding further. To preview the Installation Instructions, please click here. The sermon files are in .docx format. Please Note: You may download or listen free of charge to any of the audio sermons individually via the following links to pages on this site. The sermons are sorted both alphabetically and by date order. Runs on all versions of Windows as well as Linux and OS X.